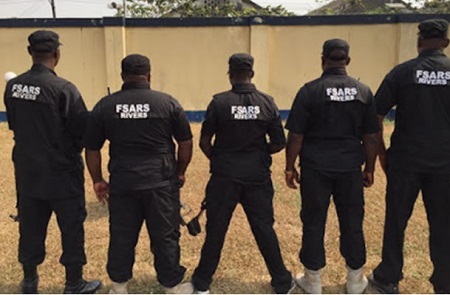 Operatives of the Special anti-robbery squad (SARS) have been ordered to restrict themselves to handling violent crimes like armed robbery and kidnapping by the the Lagos State Commissioner of Police, Imohimi Edgal. Edgal gave the warning during a lecture held for SARS personnel on Thursday at the Police Officers Wives Association (POWA) Secretariat, Oduduwa Street, GRA, Ikeja. This is sequel to the recent directive from the Inspector General of Police, Ibrahim K. Idris, that FSARS personnel must restrict their role to the handling of violent crimes like armed robbery and kidnapping and that they must dress in police uniform while carrying out their functions and not mufti as was the case. At the lecture were men and officers of the Anti-Cultism and Anti Kidnapping units. Edgal warned the men and officers never to operate in commercial vehicles. He also urged members of the public to alert the police leadership anytime they see people in mufti or inside a commercial vehicle operating or claiming to be FSARS operatives. ”The CP also wishes to call the attention of residents of Agungi, in the Lekki-Ajah area of Lagos, to be on the lookout for a wine colour bus with registration number EKY 841. The vehicle is said to be used by some men parading themselves as FSARS officials. We have sufficient grounds to believe that they are impostors,” the police stated. Meanwhile, in the last four days, the Deputy Commissioner of Police in charge of the State Criminal Investigation And Intelligence Department (SCIID), Yaba, and the Deputy Commissioner of Police in Charge of Operations, based on Edgal’s instruction, have inspected the FSARS cells. "Those detained for non-violent crimes, have their cases reassigned to other investigation units at the SCIID. "The CP directed that one other person allegedly involved in kidnapping be charged to court immediately."